On Fire is part of an ongoing series of works by artist Bently Spang (American, b. 1960) that tells the story of the 2012 Ash Creek wildfire, a fire that devastated his family’s ranch located on their ancestral homeland of the Northern Cheyenne reservation in Montana. In this work, Spang seeks out the story of the fire from the perspective of the trees he grew up with on his family’s land. 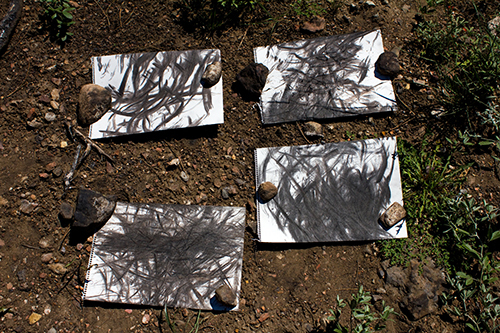 He facilitates their voice through a series of video-documented, performative rubbings on paper of the now charred trees. The resulting installation juxtaposes performance video alongside the rubbings, recalling the dialogue Spang’s people have always had with the natural world as a function of maintaining a crucial balance between human and nature. And, the artist posits, with the challenges faced today with climate change, this conversation is more important than ever. 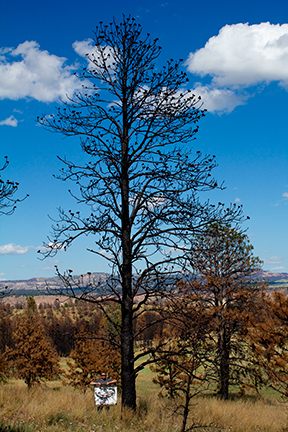 Artist Bently Spang discusses his UW Art Museum exhibition On Fire which tells the story of the 2012 Ash Creek wildfire, a fire that devastated his family's ranch located on their ancestral homeland, the Northern Cheyenne reservation in Montana.